NEW YORK--(BUSINESS WIRE)--Disney Publishing Worldwide (DPW) announced today the forthcoming publication of the Waterfire Saga, an epic new series set in the depths of the ocean where six mermaids seek to save their world, written by award-winning, New York Times best-selling novelist Jennifer Donnelly. 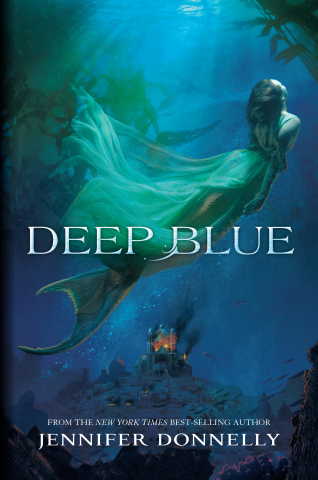 An exciting new global property created exclusively by DPW, the first book in the Waterfire Saga, DEEP BLUE, will launch in May 2014 in the U.S.
"Rich with magic and mystery, adventure and danger, romance and friendship, the Waterfire Saga is the perfect project with which to illustrate the power of DPW’s creative development capabilities,” stated Disney Publishing's Senior Vice President and Group Publisher Jeanne Mosure. The Waterfire Saga is supported by an impressive range of companion content opportunities and promotional partnerships across the Walt Disney Company, including the creation of an original song, “Open Your Eyes,” commissioned by Hollywood Records. “The global marketing and digital campaign supporting this exciting new franchise demonstrates how we can develop original content, pair it with a bestselling and critically acclaimed author, and publish it across a variety of platforms,” added Mosure. "With the Waterfire Saga, we invite consumers into a fantastic all-new world that will captivate readers and showcase DPW as a leader in next generation interactive storytelling." DEEP BLUE opens with Serafina, a mermaid of the Mediterranean Sea, awakening from a strange dream that foretells the return of an ancient evil. Her dark premonitions are confirmed when an assassin’s arrow poisons her mother. Now, led only by shadowy visions, she must search for five other mermaids who are scattered across the oceans, seas, and freshwaters of the globe. Together they will form an unbreakable bond of sisterhood and uncover a conspiracy that threatens their world's very existence. New York Times bestselling author Jennifer Donnelly’s first young adult novel, A Northern Light, was awarded Britain’s Carnegie Medal, the Los Angeles Times Book Prize for Young Adult Fiction, and a Michael L. Printz Honor. Her second, Revolution, was longlisted for the Carnegie Medal, awarded an Odyssey Honor by the American Library Association, and named Young Adult Book of the Year by the American Booksellers Association. She has also written a picture book for children entitled Humble Pie, and a series of best-selling novels for adults that include The Tea Rose, The Winter Rose, and The Wild Rose. Disney Publishing Worldwide (DPW) is the world's largest publisher of children's books and magazines with over 700 million products sold each year. DPW consists of an extensive worldwide licensing structure as well as vertically integrated publishing imprints, including Disney Book Group in the U.S. and Disney Libri in Italy. DPW publishes a range of children's magazines globally, as well as Disney kids magazines in the U.S. Disney English is DPW's English language learning business, which includes Disney English learning centers in China and a worldwide retail-licensing program. DPW's digital products include bestselling eBook titles as well as original apps. Headquartered in Glendale, California, DPW publishes books, magazines, and digital products in 85 countries in 75 languages. For more information visit www.disneypublishing.com.